Bonnie & Clyde were machine-gunned down in Louisiana by a local posse. John Dillinger was all but assassinated by the FBI outside the Biograph Theater, just after screening the gangster-themed picture Manhattan Melodrama no less. Legendary French bank robber, frequent prison escapee, and criminal icon Jacques Mesrine was ambushed by authorities at the Porte de Clignancourt, where he was shot to death next to his lover Sylvie Jeanjacquot. Criminals of this sort seem propelled by something that won’t let them quit; their crime spree lives drive them toward death. Courts don’t know what to do with them; prisons can’t hold them. Rather than face the repeated humiliation of allowing such criminals to continue undermining them in a public forum, authorities have no other choice but to take them down. Such tragic yet inevitable stories have been a part of cinema from Raoul Walsh’s White Heat to Michael Mann’s Public Enemies. Detailing the latter part of Jacques Mesrine’s life leading up to his unavoidable demise, Mesrine: Public Enemy No. 1 is the second part of director Jean-Francois Richet’s diptych crime saga that began with Mesrine: Killer Instinct. Released in 2008 in France and having arrived in the U.S. in 2010, the films earned much acclaim for actor Vincent Cassell, the French actor from La Haine and Eastern Promises. The unfortunate month-apart and limited distribution of the two films prevented audiences from experiencing them as they should be seen: back-to-back as a double-feature. And while many critics will argue that the two films can be understood individually, the momentum of Mesrine’s rise is awkwardly paused at the end of Killer Instinct, only to pick up with a vengeance within the first minutes of Public Enemy No. 1. Eliminating the gap makes them all the more effective. It’s difficult to judge the latter film on its own, if only because the two films are so organically linked. 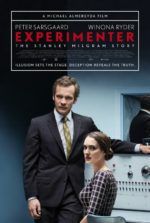 Given Music Box’s truncated distribution schedule, I didn’t see the second film until months after the first; and yet that long period between films didn’t disconnect them. In true biopic form, the Mesrine story details the subject’s criminal life from its inception to his violent death. Killer Instinct has no climax or narrative arc on its own; its themes and character’s growth spill over into Public Enemy No. 1. And so, perhaps it is Music Box’s faulty marketing tactic or a Kill Bill-inspired creative choice by Richet that these films were bisected, but they exist better as a whole. Viewers who see just one or the other will feel that they’re missing something, whereas when seen consecutively, they feel like an epic—a biopic crime movie on the level of Bugsy or Scarface. In Public Enemy No. 1, we find Mesrine back in France after his bank robbing bender in Canada from the end of Killer Instinct has ended. There’s a series of arrests and jailbreaks that follow, always with Mesrine more concerned about his public image that his capture. During one prison sentence, he completes a manuscript for his autobiography (the basis for Killer Instinct) and revels in the attention it brings him. His final string of robberies is committed with a partner, François Besse (Matthew Amalric), with whom he executed a daring prison escape. Once free from prison, he carries out bold heists with Besse and meets Sylvie Jeanjacquot (Ludivine Sagnier), his companion for the remainder of his days. Yet, the crimes themselves are given less detail than Mesrine and his obsession with retaining the attention of the media and public. His public image ultimately does him in, however, after he retaliates to bad press by attempting to kill the journalist responsible—after a severe beating and gun shots to the back, the journalist miraculously survives. After that, Mesrine’s public image wavers and the police hunt him down. The question of identity rises. Who is Jacques Mesrine and what did he stand for? Based on Richet’s two-part saga, even the man himself wasn’t sure. He begins as a gangster, but then after enduring the French prison system, there’s always an inkling of rebellion in him—as if he’s still trying to undermine nonexistent prison walls around him by continuing to rob banks. 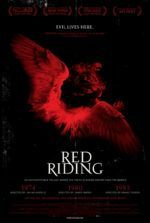 As Besse learns, Mesrine becomes bored with robberies and assigns himself the title of revolutionary, aligning himself with Communist extremists to discuss taking on prison infrastructure. 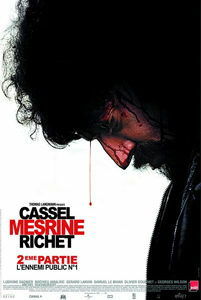 Terms like “gangster” and “revolutionary” don’t really apply to Mesrine, and perhaps that’s why Cassell is so wonderful in the performance. Mesrine is all about personality and energy, two characteristics that make Cassell such a unique performer. This is one of the great criminal performances in cinema, a despicable human being made genial through the actor’s charm. What’s admirable about the production is that Richet avoids trying to define or assign biographical meaning to Jacques Mesrine. The films result in a mere window glimpse into their subject, jumping from this event to that because, frankly, there was just too much going on in Mesrine’s life to capture it all (this is particularly true in Public Enemy No.1, which can sometimes feel like it lacks cohesiveness due to his never-slowing momentum). But the presentation mirrors the sort of locomotive-paced lifestyle that propelled Mesrine’s criminal career and made him into a folk hero among the French, and Cassell’s immense presence carries the character’s magnetism straight through. As individual films, Killer Instinct and Public Enemy No. 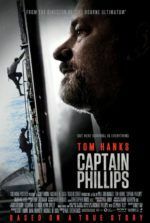 1 leave the viewer wanting more, whereas viewing the films back-to-back at home will lend this impressive work the complete presentation it deserves.